Measuring 2ft 4in x 19½in (71.5 x 50cm) with matching 5½in (14cm) long tacked arm section covers, it was finely embroidered in polychrome silks. 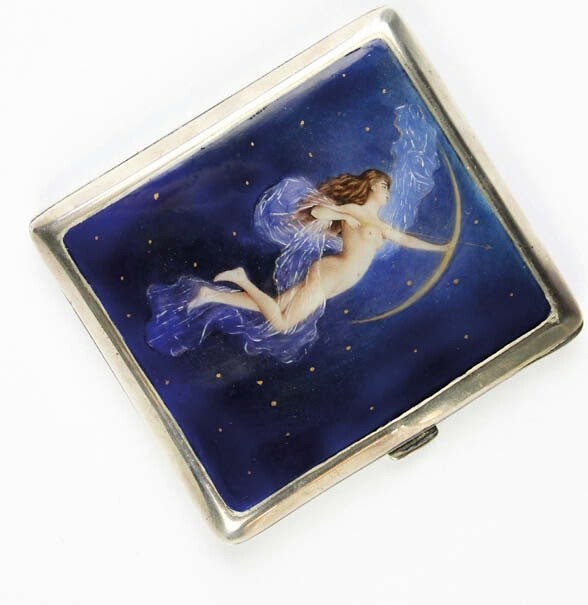 There was some staining and fraying but overall it was in good condition and, against a £500-1000 estimate, sold to a Chinese collector at £6500 on December 16. From the same country house loft came a late 19th-early 20th century blue-ground dragon court robe. 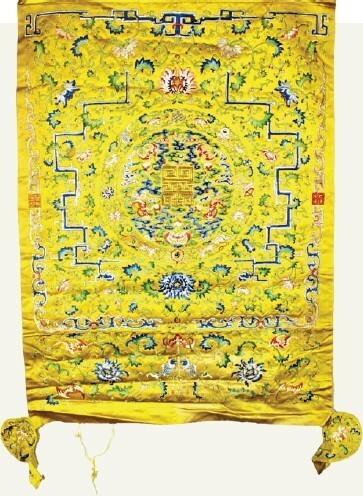 The 4ft 9in long x 7ft wide (1.46cm x 2.14m) robe, featuring Shou medallions and symbolic Buddhist treasures, showed signs of wear, including staining under the arms, but took £4700 against hopes of £500-700. Chinese enamel and copper bowls – £3200 at Moore Allen & Innocent. It’s worth a reminder that most Chinese pieces sell at low three-figure and often two-figure sums. Nevertheless, a pair of enamel and copper bowls offered at the January 12 antiques and general sale at Moore Allen & Innocent (20% buyer’s premium) at Cirencester looked attractive against the £30-50 estimate. Part of a job lot which included a Shelley dripware jug and an Art Deco pottery clock case, the bowls, slightly dented and scuffed but otherwise in good condition, tempted bidders to leap from £100 to £2000 on the internet and finally sold to a UK bidder at £3200. Chinese porcelain bottle vase – £9500 at Tennants. 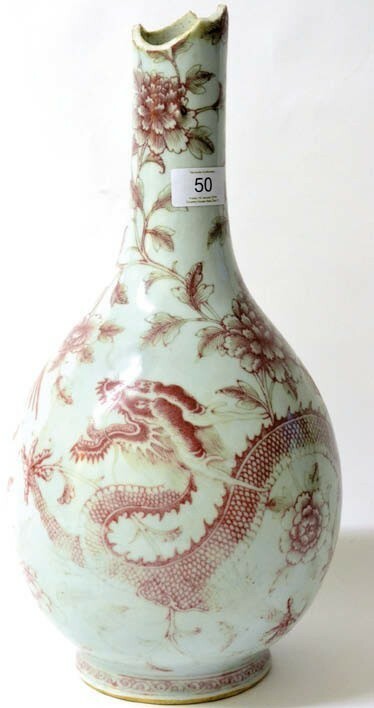 Damage to the neck of a Chinese bottle vase kept the estimate down to £100-150 at Tennants (20% buyer’s premium) in Leyburn on January 19, but bidders thought more highly of it. Standing 16in (41cm) high and catalogued as probably 18th century, it attracted international bidding and eventually sold at £9500.